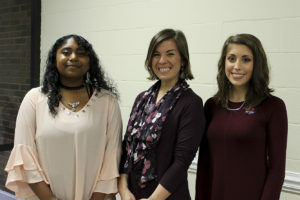 The Johnston County Board of Education recognized the two winners from the district competition of Poetry Out Loud during the Johnston County Public Schools Original Poem Competition held recently. Mia Lopez-Ramos (left), a student at Johnston County Early College Academy, was recognized for being the Original Poetry Winner for her poem Last Onset. Kiley van Ryan (right), a student at West Johnston High, was recognized for being the Poetry Out Loud Recitation Winner for To Cupid by Joanna Baillie and Self-Help by Michael Ryan. Pictured with Kiley van Ryan is West Johnston High Poetry Out Loud coordinator Emily Scott (center).